Long live working class internationalism in action! An example for other sectors. Against the international backdrop, in which bosses and governments inflict a ‘shock and awe’ agenda of attack after attack on working people across the world, each significant victory obtained by the world workers’ movement must be “shouted about from the rooftops”. 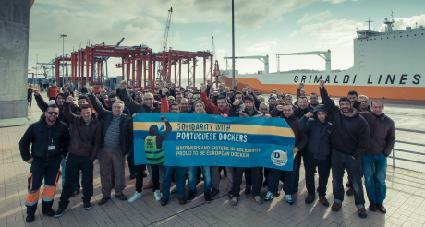 Such is the case of the dock workers, who in recent weeks have scored important victories in key disputes in Portugal and Chile. They have done so by returning to the movement’s tried and tested methods of militancy: of sustained and serious struggle, and solidarity strike action, including international action organised across borders. These examples show that despite the pernicious role of right-wing trade union leaderships in the majority of countries which act as a brake on the struggle, the working class can still make strides forward, when organised on the basis of militant methods. They also show how, despite the dominance of “social partnership” trade unionism and near-passivity before the bosses’ onslaught among the leaders of the movement, the proud militant traditions of our class have not been extinguished by any means. 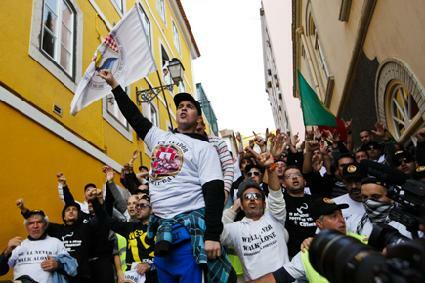 In Portugal, workers and young people have faced years of troika austerity and have fought back determinedly, including through 4 general strikes. However, the leadership of the trade union movement nationally has failed to tie these struggles together in a sustained militant plan of action to defeat the Troika and government attacks, allowing isolated, one-day mobilisations to peter out into long periods of demobilisation. The dockers, in breaking with this approach and engaging in a 2-year long militant battle, have presented an alternative path to the whole movement: that of sustained and determined action which can win results. They faced a far-reaching plan to transform Lisbon’s docks into a den of precarious labour, part of the privatisation agenda imposed by the Troika and implemented by the government. Bosses had established a parallel employment company charged with taking on staff on a precarious basis with a cut of one third in wages, in an attempt to end decent conditions at the port. The workers’ response was 2 years of militant strike and “work to rule” action. 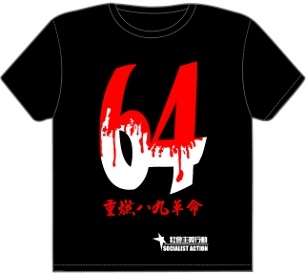 They faced up heroically to repression, and 47 workers were sacked for their part in the action. Their victory was stunning. Not only did they achieve the re-admission of their 47 sacked comrades, but also an end to precarious contracts and a new collective bargaining agreement which will include those workers who have originally been taken on as precarious. This victory throws a spanner in the works of the capitalist class’ plans to make more and more precarious the conditions of ultimately, the Portuguese working class. 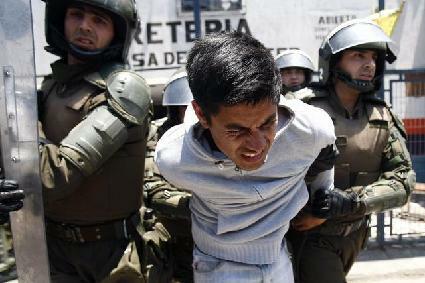 In Chile, when dockers in Mejillones, struck alone in January for wage demands, against the non-payment of wages and against anti-union practices – their second strike in 1 year – some condemned their struggle to isolation and failure. However, when police attacked the strikers’ camp which also housed their wives and children, injuring one worker, the tide changed. 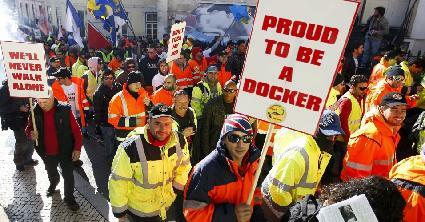 This strike was also important as it challenged not only the port bosses, but also the country’s draconian Labour Code laws, inherited from Pinochet’s dictatorship. Under the code, the bosses refused to negotiate collectively with the workers, insisting on dividing those on fixed contracts from casual labourers (which represent 80% of dock workers). They refused this undemocratic imposition and stepped up the action. Workers in 9 ports throughout the country joined in the strike action, bringing their own demands (against anti-union repression and the non-payment of wages in most cases) with them. This is again hugely significant as the same Pinochet Labour Code bans solidarity strike action! Their victory, as well as that of the Portuguese dockers, also reflects the enhanced economic power enjoyed by dock workers (but also workers in many other sectors) given capitalism’s “turn to exports” in many countries, especially those of Southern Europe. 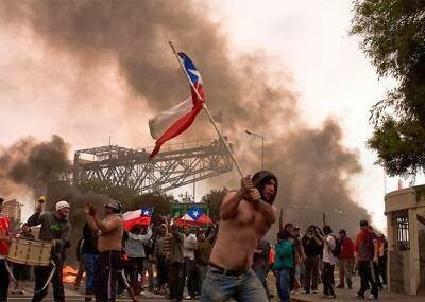 In Chile, the capitalist press denounced multi-million dollar losses for export companies due to the strike, especially regarding the export of perishable goods. Long live international solidarity in action! Additionally, these victories both featured another element, crucial to the workers movement internationally – that of international solidarity action. 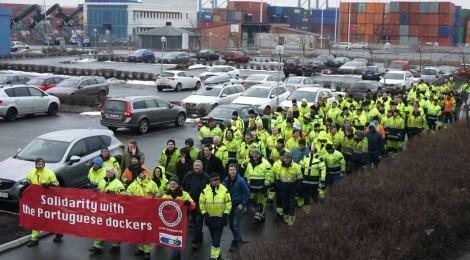 Two international days of action were organised in support of the Portuguese dockers, with the last one in January seeing solidarity actions, including strikes, in Sweden, France, the USA and elsewhere. In Chile, as well as spreading throughout the country, the dockers’ struggle received active and crucial support from dockworkers throughout Latin America and beyond, with Argentinian ports blocked to Chilean goods and similar action threatened in European and US ports in the days prior to victory. 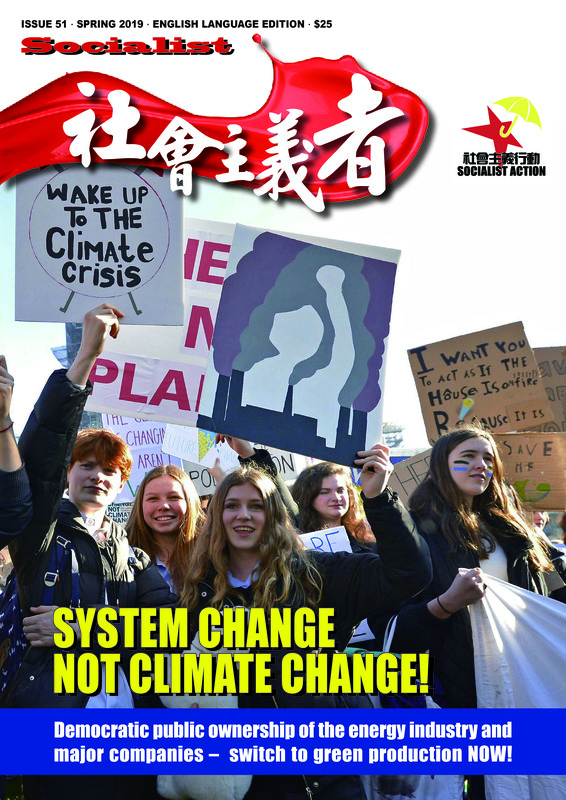 The CWI has underlined repeatedly the necessity for the workers’ movement internationally to coordinate action across borders, mobilising the international power of the working class in an increasingly interlinked world economy. This need is especially burning in Europe where the Troika and capitalist governments inflict a coordinated misery offensive on working people throughout the continent, especially in the South, which poses the need for an internationally coordinated fightback, including international strike action. We call on the trade union movement internationally to follow the shining example of the Portuguese and Chilean dockers who have shown that such methods win results.